One time the Saint desired to go see his parents, since he was still young in age. Defeated by his desire, he went to go see them, but his parents immediately sent him back, saying: "Child, it is necessary that you remain, where you were dedicated." Having returned to the Monastery, Saint Lucy appeared to him that night, coming out of her container, and she frightened him and was about to harshly beat him, but then a most glorious woman, dressed in royal purple, shielded him (perhaps it was the Lady Theotokos). This embarrassed Saint Lucy, so she only slightly beat him. Then she delivered him a message, saying that he should never go outside the Monastery again. This he promised to do, and indeed he kept his word. The blessed Zosimos also gives an account of a certain woman, who came from a noble family, and who was shameless in her mind and impure. Because she had been beaten harshly by her husband, she went to the Monastery of Saint Lucy, first in order to flee the sufferings bestowed upon her by her enraged husband, and also to be healed of the beating she received. When night came, Saint Lucy yelled out with such a voice, that it entered the ears of Zosimos who was sleeping, and she said, "Remove the unclean woman from the Monastery," and she said this while pointing with her hand. With much fear Zosimos got up, and said to the servants of that woman: "Quickly rouse your mistress from here, and take her outside with her bed." The servants then approached the bed, and they found their mistress dead. When the Abbot of the Monastery died, then all the brethren left Zosimos alone to protect the Monastery, and they went to the Bishop of the city named John, that he may ordain another worthy abbot from among them. The Bishop asked them, "Is there another brother in the Monastery?" They said, "There is no other, except for one that we left behind to protect the Monastery." The Bishop responded, "I recognize that he is the one worthy to become Abbot." He was therefore invited to come, and immediately he was sealed and given to them, saying, "Behold brethren, your sealed overseer in God and Abbot." Shortly after this he was ordained a Priest. He therefore went on to shepherd his flock for forty years, with all meekness and forbearance, with pure love and excessive sympathy. 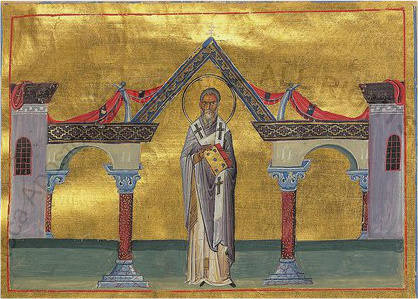 When the Bishop of Syracuse died in Sicily, then with the election of God and the pleading of all the Christians there, the Saint became Bishop of Sicily, by the hands of Pope Theodore of Rome, and he governed it venerably in a God-pleasing manner for thirteen years. Having worked many miracles, and conducting himself as an ascetic, he departed to the Lord. Many sick people were healed of their various ailments both before he was buried and after he was buried. The demonized were liberated, and the blind were able to see again. One Christian had a wife with an issue of blood, and taking a piece of the garment of the Saint, he gave it to his wife, and she became a recipient of healing for her suffering, with the flow of blood immediately ceasing.